A Symposium titled ‘The Myriad Faces of War: 1917 and its legacy’, has just been announced in association with the Massey University . This international and multidisciplinary symposium brings together an eclectic range of speakers from around the world to explore the many themes and faces from the First World War and associated events. It will be held at Te Papa Tongarewa from April 25 to 28, the event is jointly organised by WHAM (War History Heritage Art and Memory) Research Network; Massey University; Auckland War Memorial Museum; the University of Auckland and Ministry for Culture and Heritage. The diverse programme embraces topics as wide-ranging as propaganda to poetry and patriotic songs, the horrendous death toll on the Western Front at Passchendaele to the fate of Palestine and the birth of modern Iraq as well as revolution in Russia. The advent of plastic surgery to repair maimed soldiers, submarine warfare, the impact of war in Germany and Latin America, as well as New Zealand’s emerging national identity and mythology, memorialisation and masculinity are also among some 60 presentations. 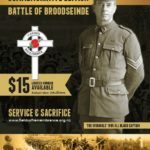 Presenters include well-known New Zealand figures in war, memory and cultural studies including Jock Phillips, Monty Soutar and Professor Glyn Harper. They will be joined by international war and culture studies specialists such as Jay Winter; Annette Becker and Michael Neiberg. Registration for Myriad Faces costs $390 before January 9, 2017, or $450 after this date.